We have to endure this stuff. I think we better get out of this place. The first fellow is about to hurl, no? These tacky dwarves were on the island of Burano, in the harbor. It is known as the lace-making island, and has the prettiest colored houses. These were in a back alley. 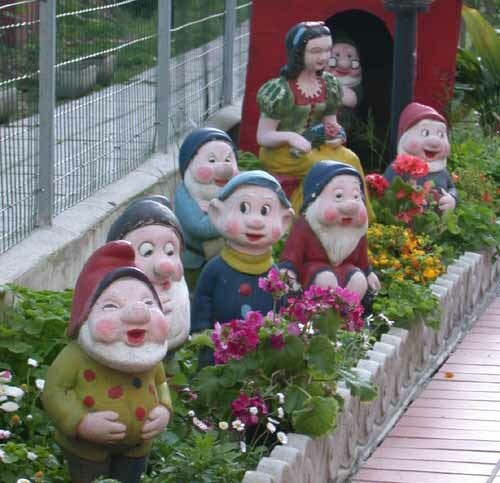 I have no idea, absolutely no idea, what inspired the inhabitants to fill their little garden area with these dreadful dwarves! Weather has been sunny in the morning and cloudy in the afternoon, which is great, since the mists in Venice are very romantic.